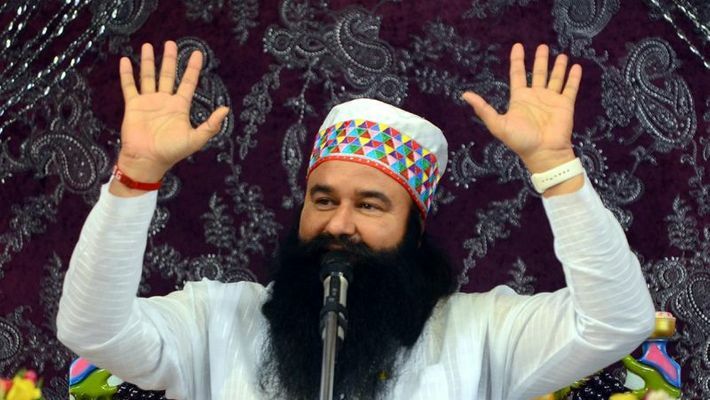 New Delhi: The Dera Sacha Sauda sect head Gurmeet Ram Rahim seems to have found another way to make headlines. 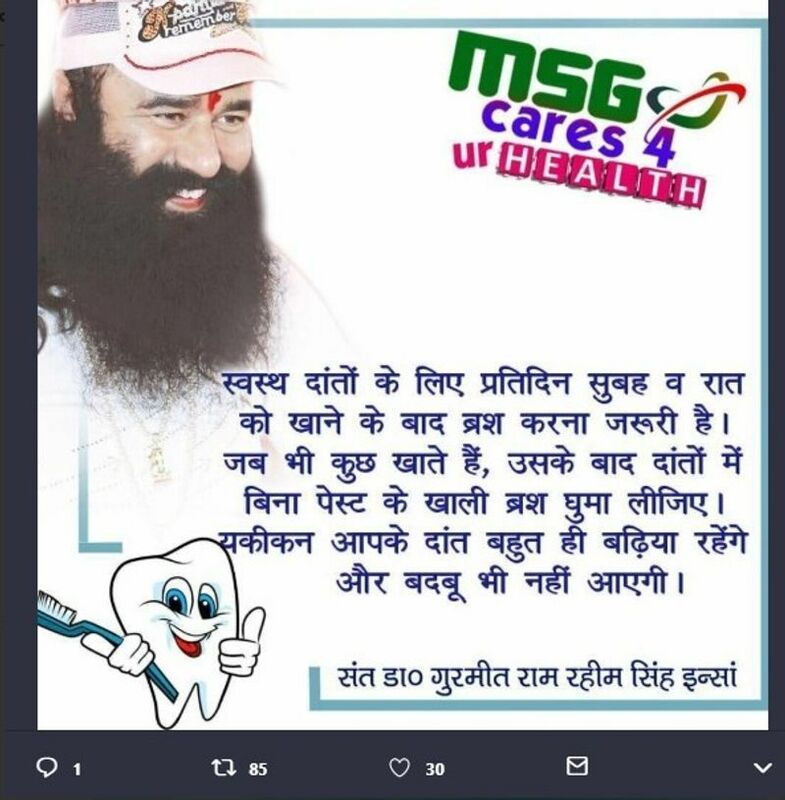 After assailing your eardrums with his questionable musical skills in the MSG movies and your eyes with his OTT wardrobe, the guru is all set to attack your health. 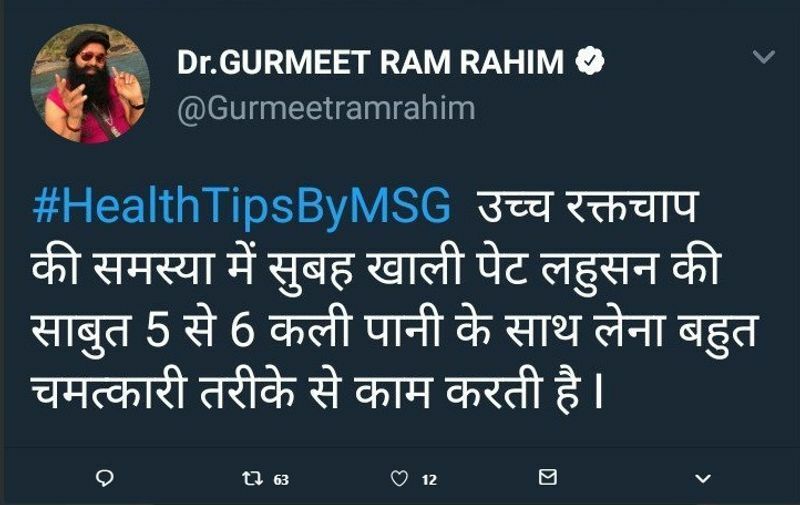 In the wee hours of Sunday morning, February 2, his followers launched a massive Tweet attack of so-called health tips by Singh, who was recently convicted of the murder of journalist Ram Chander Chhatrapati. 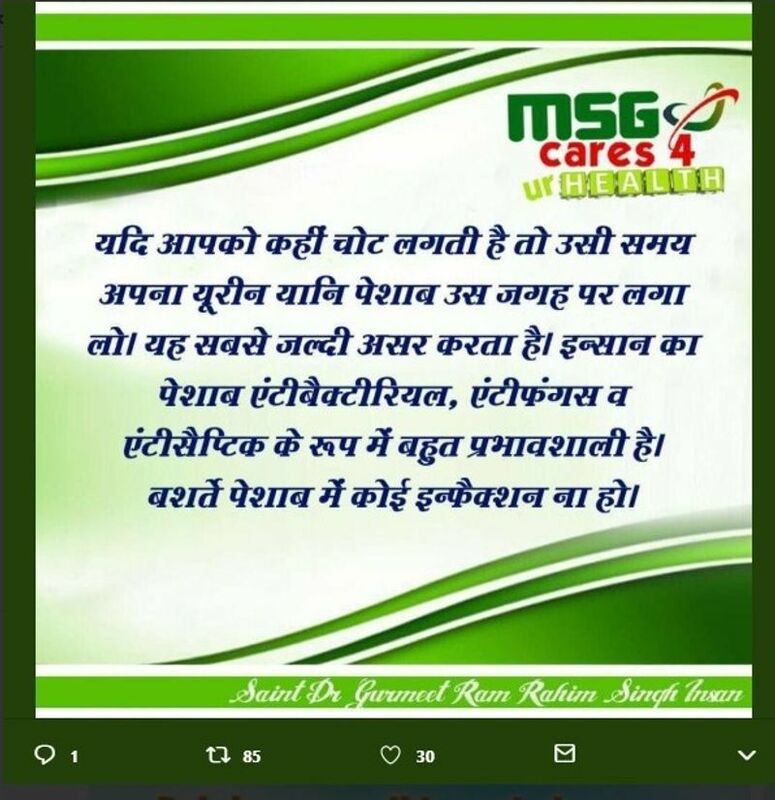 The hashtag #FitnessMantrasFromStRamRahim began trending on Twitter and found many takers. We spoke to certified doctors to tell us if these mantras are myth or reality. MYTH: "I don't agree that this will help you lose weight. It is a good practice but I don't think it helps much with weight-loss. 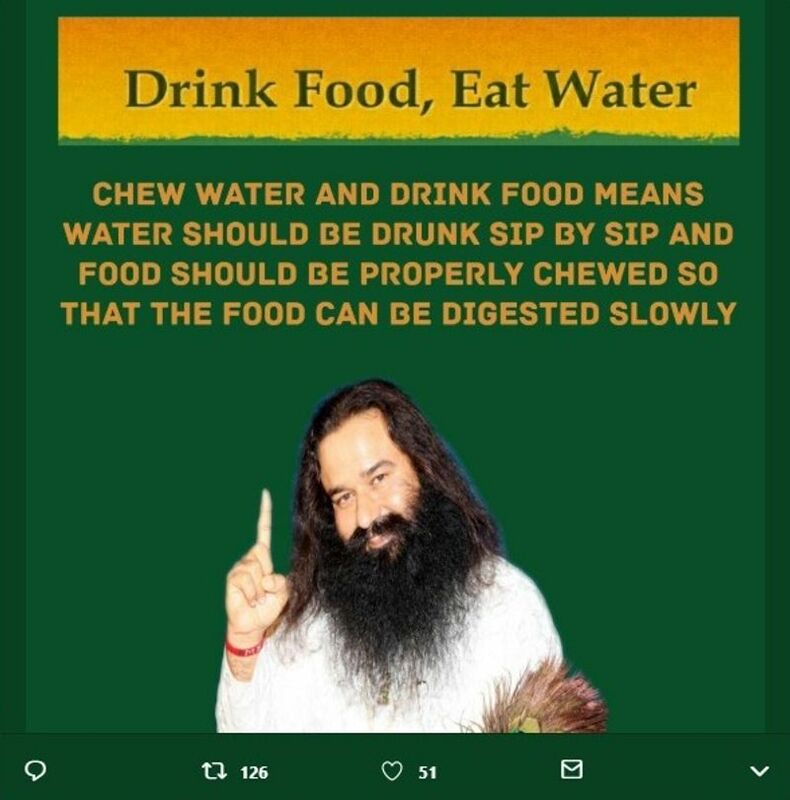 It is an Ayurvedic practice that if you drink water too fast it will not hydrate your body that well and of course, chewing your food well is another well-advocated old advice. But it will not help with losing weight because you cannot expect results while chewing a slice of pizza slowly," says Dr Shikha Sharma, nutritionist and dietician, Dr Shikha's Nutri Health. MYTH: "This is a blanket statement that does not be blindly followed. 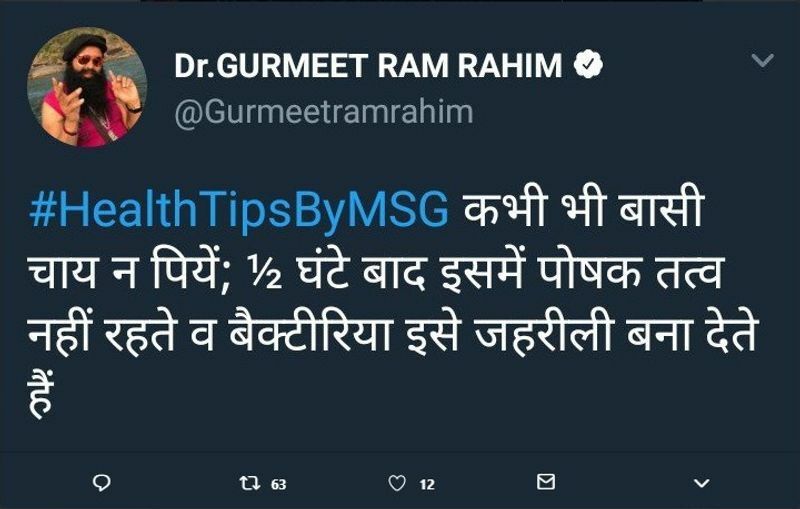 Ayurveda clearly states that people with pitta prakriti should not eat garlic. They will have acidity and other problems," says Dr Shikha Sharma, nutritionist and dietician, Dr Shikha's Nutri Health. MYTH: "If you are re-heating tea, that can create more toxins but if you are having thanda chai that is not poisonous. Continuously re-heating chai as they do in some roadside shop when the base of ginger and tea leaves remain the same and they keep adding more water or milk, is dangerous. This statement is like saying people can die of iced tea poisoning. If this was true, all homemakers would be poisoned every day because most mothers forget to drink their teas while doing household chores," says Dr Shikha Sharma, nutritionist and dietician, Dr Shikha's Nutri Health. You can brush your teeth without toothpaste. MYTH: "Toothpaste have certain ingredients such as abrasive powders, a certain amount of fluoride and various other things that clean the surface properly. Just like we use soap to clean our utensils rather than just water. Secondly, the fluorides get deposited on your teeth and create something called fluorapatite, which is extremely good to strengthen the dental structure. This also helps lower the formation of cavities. So, you can brush without a toothpaste but not for very long, it is advisable to use paste," Dr Pallavi Vengurlekar, dentist, Britelife Dental Clinic. Applying urine on an injury works as an antiseptic. MYTH: "Water makes up 91 to 96 per cent of your urine. The rest is made from salts, ammonia, and byproducts produced during normal body processes. However, research on urine composition shows that bacteria can contaminate urine as it exits the body. So, please do not," says common-sense.